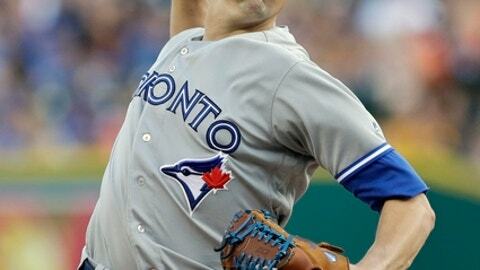 TORONTO (AP) The Blue Jays figure a healthy Aaron Sanchez can lead them back into the playoffs. Sanchez was an All-Star in 2016, when the right-hander went 15-2 with an American League-leading 3.00 ERA. But blisters on the middle finger of his pitching hand caused four stints on the disabled list. He went 1-3 with a 4.25 ERA and didn’t pitch after July 19. ”I’ll have to maintain it like I have in years past, but no more of the disaster that it had last year,” he said. Toronto used a club-record 14 starters last season en route to a 76-86 record and fourth-place finish in the AL East. Only Marcus Stroman and Marco Estrada made 30 starts, and the fill-ins weren’t enough to make a playoff run. NEW LOOK: Outfielders Randal Grichuk and Curtis Granderson and infielders Aledmys Diaz and Yangervis Solarte are Toronto’s primary offseason additions. Grichuk and Diaz arrived in separate trades with St. Louis, Solarte was acquired from San Diego and Granderson agreed to a $5 million, one-year contract as a free agent. Grichuk is expected to take over in right field from Jose Bautista, who became a free agent and remains unsigned. ROOKIES TO WATCH: Two sons of former big leaguers top Toronto’s prospects. Shortstop Bo Bichette and third baseman Vladimir Guerrero Jr. were teammates at two levels of Class A last season and both appeared in the All-Star Futures Game. Bichette’s father Dante hit 274 homers for five teams in a 14-year career, while Expos and Angels star Vladimir Guerrero was voted into the Hall of Fame last month. THEY’RE SET: Toronto got limited production from its backup infielders when second baseman Devon Travis and shortstop Troy Tulowitzki sustained long-term injuries last year. Travis and Tulowitzki are healthy as camp begins but their history is worrisome. Tulo has missed at least 30 games in six straight seasons while Travis has battled knee and shoulder issues. Solarte hit 18 home runs and and played every infield position for the Padres last year. Diaz slumped in 2017 after hitting 17 home runs and making the All-Star team as a rookie in 2016. He has played shortstop, second, third and left field. THEY’RE NOT: Unless they acquire another pitcher, the Blue Jays may give the fifth starter’s job to right-hander Joe Biagini. Switching between the bullpen and the rotation, Biagini went 2-12 with a 5.73 ERA in 18 starts last year. Signing another starter might allow the Blue Jays to use Biagini exclusively in relief, where he has a 3.44 ERA in 86 games over two seasons. ON DECK: Will the Blue Jays use spring training to talk contract with third baseman Josh Donaldson, who can become a free agent after the season? The 2015 AL MVP set a record for a one-year contract for an arbitration-eligible player with a $23 million deal. He wants to remain with the Blue Jays but said last month he had not 0received a long-term offer.